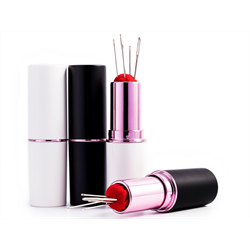 Conveniently store your needles and pins in style Lipstick case with pin cushion. Perfect for travel & gift. Includes a variety of 5 hand needles. Simply turn and open like a normal lipstick! Colours: Black, White specify in note box.